Selecting a pool table that’s ideal for your home requires planning and measuring. A table perfect for one person’s man cave may not look as great in your game room, and vice versa. If you have a family, there are specific qualities you have to think about, so you can pick out a product that will last through some roughhousing and beatings. This is largely dependent on the available square footage in your living room or game area. A 9-Foot tournament table may not be in store for your future, but you can have just as much fun from 7-Foot and 8-Foot pool tables. Get a smaller table for your home if you’re sure your kids will be running around and making a mess, so all of you will have room to play. 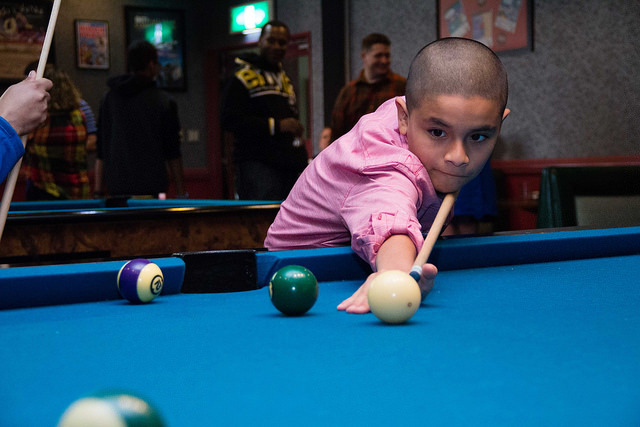 Your kids will want to play pool with you because it’s a sport that’s restricted to a table and thus seen less often. Unfortunately, they’re likely to treat the table with less respect than you. The slate of the pool table will warp over time because cue balls and sticks constantly strike it. As a result, it becomes unlevelled after being repeatedly hit. Thicker slate, typically between 3/4 inch and one inch, will always last longer and can endure more damage over time. The billiard cloth receives a lot of surface-level damage, with cue sticks accidentally striking it or cue balls speeding across it, burning the material. 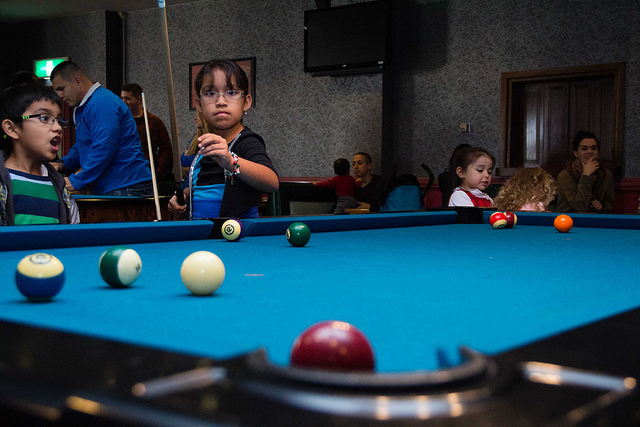 If you’re playing pool with your kids, chances are the felt is being used more often than if you were just playing by yourself. Pool table felt comes in different weaves. A tighter weave uses more material than a looser one, so it can sit through more games. A felt’s ounce weight per yard will indicate how tight a weave is: if it’s heavier, the weave will be tighter. 19 oz. is the minimum weight you want to go for if you’re looking to play pretty often. Hardwood, while a more expensive material used in pool table frames, is also the most durable. You’re going to see your kids bump into the table and accidentally hit it with a cue stick or a toy. Synthetic materials or laminate will not be able to last through this damage, and your pool table may not last as long as you want it to. Stick with quality materials so your pool table can become part of the family! It’s important for you to know how to treat and maintain a pool table, but communicating the information with your kids is crucial so your table may last. Now that you and your kids know how to select and treat a pool table properly, you can search for something that’ll fit in perfectly to your home! GameTablesOnline.com has a vast selection of tables and accessories available, so you’ll always be able to find something that’s right for you and your family.